Greenwich Village beer hall with better-than-average pub grub. 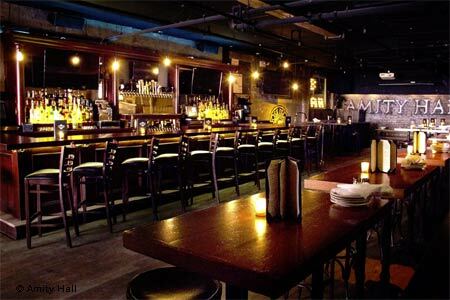 : Claiming to be Manhattan’s only beer hall (it depends, we suppose, how you define “beer hall”), this Greenwich Village beer-centric bi-level spot boasts stone and brick walls, plenty of wood furniture and a wood-burning fireplace to add to the cozy vibe. There are 40 beers on tap (plus a small wine selection and a large whisky menu) from all over the world, including several local craft brews as well as some suds from Belgium. The food menu is a step above most grub-oriented pubs: a large variety of better-than-average stuffed burgers (filled with your choice of blue cheese, feta, short rib or bacon, among other options) as well as big salads and sandwiches (including a good porchetta panino) make this Third Street venue a fine place to while away an afternoon or evening.